The word Sant in Punjabi is akin to ‘saint’ and denotes a spiritually elevated human being. Such people act like beacons to kindle spiritual fires in the hearts of those who come into contact with them, through their divine knowledge, humility, magnanimity and compassion. Sangat means ‘company’ in general and ‘religious congregation’ in particular. Sikhism places importance on true sangat for an individual to progress on his personal spiritual path. Keeping the sangat of true saints is an opportunity to receive guidance and blessings from those who, through every aspect of their lives, have walked the Guru’s path and reached an exceptional stage of enlightenment. Sant Baba Puran Singh Ji of Kericho, known affectionately as ‘Baba Ji’, stands as one of the most eminent and influential Sikh saints of the twentieth century. He was born in 1898 in the Punjab village of Gura, and belonged to a family which had long served great holy men of the region. Married at a young age, he placed strong emphasis on the Sikh principle of gristi jeevan, living the life of a householder, will all its responsibilities to the family and society, rather than choosing a reclusive life of meditation. Emigrating to Kenya in 1916, he soon set up ‘Kericho Wagon Works’ in the small town of Kericho and focused on earning a living, being a father to his family and helping others in the town, notably through municipal improvement schemes, such as the renovation of hospitals, schools and churches. His civic contributions were officially recognized by naming the Town square as Sant Puran Singh Square. He also devoted himself to a private life of meditation and maintaining a Sikh way of life, demonstrating that modernity and spiritual growth need not be contradictory. 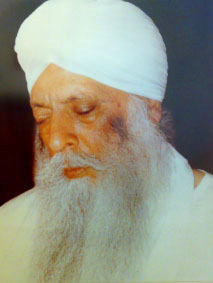 In 1952, Baba Ji’s spirituality was given open recognition by a visiting saint, Sant Baba Mani Singh Ji, from India. Thereafter, his immense compassion and connection to God drew thousands to Kericho. His message was not just a philosophy of words; he was a personification of the proverb ‘practice what you preach’. Adapt to the times, but don’t compromise on your religious duties, or your love and respect for parents and family. Stay in awe of the Creator and respect the Guru’s teachings, channel this into action by coming and bringing your children to the sangat. Learn humility and respect for others by serving the sangat, whilst also being engaged in meditation. Learn your prayers and aspire to take Sikh baptism. In addition, Baba Ji called for all service to be Nishkam – totally altruistic, a principle he applied resolutely to himself at all times. In the 1970s, he came to England, where many significant, often unprecedented events were made possible through his divine guidance. This included a historic and highly spiritual Sampath Akhand Paath, an 11-day programme of prayer which set the pace for others in years to come. In 1982, he endorsed a peaceful mass campaign in connection with the ‘Turban Case’, where a petition handed to Downing Street led to a ruling which would protect Sikh rights of identity under British Law. A similar mass campaign to resolve the growing problems for Sikhs in India was held in May 1983, with a petition to the India High Commission. Just a week later on 5 June 1983, Sant Baba Puran Singh Ji left for his heavenly abode, leaving a legacy of exemplary Sikh practice which is the inspiration for all endeavours of the GNNSJ.